Chinese cinema witnessed a remarkable milestone in the year of 1979: the Beijing Film Academy, then the country’s only film school, re-opened after it was closed during the Cultural Revolution (1966-76). Four years later in 1982, 153 students graduated, earning a special title – the “fifth generation” of filmmakers. The class of 1982 takes pride in its most decorated alumni: Chen Kaige, Zhang Yimou, Gu Changwei, Li Shaohong and Tian Zhuangzhuang – and Zhang Li. Widely acclaimed as China’s finest director of historical dramas, Zhang is best known for producing quality historical television series such as Towards the Republic (2001), The Great Ming Dynasty in 1566 (2007), The Road We Have Taken (2009) and Young Marshal (2015). Both Towards the Republic and The Great Ming Dynasty in 1566 earned an exceptionally high rating of 9.7/10 on China’s leading content review website Douban. The Road We Have Taken was also well-received with a rating of 9. Like other fifth generation directors, many of Zhang’s works, which target an educated audience, explore the depth and profundity of the nation’s history and imbue it with humanity. Zhang’s name has been considered a guarantee of quality costume dramas. Nevertheless, the 61-year-old director astonished audiences with his new directorial work, Martial Universe, a fantasy drama adapted from a popular web novel of the same title. Airing on August 7, 2018, the show has drawn much criticism from book fans for not being faithful to the original work. Zhang attempted to instill a sense of history into the lighthearted show, but the young audience is not content with his changes. First broadcast on CCTV in spring of 2003, Towards the Republic showcases significant events during one of the most vivid, intricate and tumultuous periods in China’s modern history, namely the time between the late 19th century and the early 20th century. During this era, China witnessed a series of major events that led to the collapse of the Qing Dynasty (1644-1911) and the founding of the Republic of China, including the first Sino-Japanese War (1894-1895), the “One Hundred Days of Reform” of 1898 (a failed 103-day national, cultural, political and educational reform movement undertaken by young Guangxu Emperor and his reform-minded supporters); the Boxer Rebellion of 1900; the Xinhai Revolution of 1911, which put an end to China’s more than 2,000 years of imperial reign and established the Republic of China; militarist and politician Yuan Shikai’s short-lived attempt to restore the monarchy in China by elevating himself to the status of emperor, and the attempted restoration of the last Qing emperor Puyi. The 59-episode series manages to present a new historical narrative by boldly reassessing the reputations of relatively recent historical figures and events, an exercise which is frequently at odds with the official version of history supported by the Chinese authorities. The series attracted controversy by portraying infamous historical figures – Li Hongzhang, Empress Dowager Cixi and Yuan Shikai – in a sympathetic light. Li Hongzhang, a leading general and statesman of the late Qing Empire, has been a target of criticism as a traitor to the nation for his relations with Western powers and Japan, and the appraisal is echoed in official textbooks and other documents. Zhang’s show explores the multiple sides of this complicated figure and depicts him as a sophisticated politician, adept diplomat and industrial pioneer of the empire. Cixi has long been considered a notorious historical figure and is blamed for several decisions that resulted in a series of woes for the country. In Zhang’s drama, Cixi’s political talents, feminine vulnerability and motherly sides are portrayed, which make the character appear more human and three-dimensional. Due to its portrayal of historical issues deemed politically sensitive, the series was censored by the government. Some episodes had to be re-edited, and a planned repeat airing on provincial television stations was canceled. The Great Ming Dynasty in 1566 (2007) is another of the director’s well-known costume dramas, and is favored by audiences. It panoramically displayed the historical images during the reign of the Jiajing Emperor of the Ming Dynasty (1368-1644): the intricate political struggles from the court to governments of all levels, rampant corruption and falsehoods from officialdom to business circles, as well as Chinese people fighting against Japanese pirates. Some argue that the show draws upon historical allegories to explore the history and power relations of contemporary Chinese society. In 2009, Zhang presented The Road We Have Taken, which depicts the chaotic period from 1925 to 1949 using the fate of three children of a large family in Hunan Province set against a number of major historic events, such as the Second Sino-Japanese War (1933-1945), Chinese Civil War (1945-1949) and the foundation of the People’s Republic of China. In 2015, the director filmed Young Marshal, a drama centering on the legends of Zhang Xueliang, a renowned general from Chinese modern history. Zhang, nicknamed the “Young Marshall,” kidnapped his commander-in-chief Chiang Kai-shek. The act, known as the Xi’an Incident of 1936, changed the course of Chinese history and cost Zhang his freedom for the rest of his life. 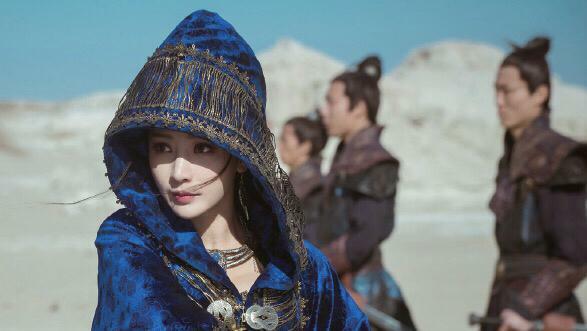 Zhang’s latest directorial work, Martial Universe, was adapted from a fantasy novel of the same name written by a web writer under the pseudonym Heavenly Silkworm Potato. The drama revolves around the story of Lin Dong, a child from a banished family of the Great Lin Clan. When he was very young, Lin watched his father get crushed and crippled by Lin Langtian, a powerful genius from the same clan. Lin is determined to take revenge on the man who took everything from his family. Armed with an iron will and determination, Lin travels across the land in order to hone his skills, and later meets two women – Ling Qingzhu and Ying Huanhuan–who both develop a romantic relationship with him. By chance, Lin obtains a mysterious stone talisman coveted by many clans in the martial world. Possessing this artifact sees Lin challenged by many people of different clans, and gets him involved in various other events of the martial universe. Lin eventually becomes one of its most powerful and respected beings. In Zhang’s eyes, compared with the intricate history of his previous series, the world of Martial Universe is very straightforward and simple – win or lose, good or evil, black or white. Having no intention of making a simple fantasy show, Zhang made lots of changes in his adaptation to make the story seem more realistic and complicated. The original novel is mostly centered on the growth of the protagonist Lin Dong. But the director believes that a hero, no matter how great he is, has an ordinary side. In portraying Lin Dong, Zhang intentionally weakened his heroic aura and made him more like an ordinary person. But the change drew much criticism from audiences, especially loyal fans of the book. “I personally believe that what made people root for Lin Dong was his drive and willpower to improve himself and get revenge – but the drama basically ignored this. For the most part the series had either character A or B helping Lin Dong, and they had to encourage him all the way,” one fan of the novel, “Nubii,” complained. In the series, the chief villain Lin Langtian is portrayed as a much more multi-layered, rounded character who actually cares for the protagonist, and his actions have been somewhat justified. Zhang also strives to explore history in the fantasy story. The sense of generations passing is emphasized in the series: unlike the original novel which is purely oriented around the protagonist, the drama highlighted the father/son, master/disciple relationships, showing the growth of the young generation as being a function of their eclipsing the older generation. Zhang creates a sense of history by manifesting a sequence of generations: “Even though Lin Dong eventually becomes the great hero who guards the martial world, he is still one link in the sequence,” he told NewsChina. Nevertheless, the director’s attempt at a complicated fantasy story did not work with young audiences. This has manifested as an unbelievably low 4.6 out of 10 rating on Douban. Many book fans expressed disappointment and accused the series of not being faithful to the original novel. “This is definitely the Waterloo in Zhang Li’s career,” a Douban user, Cai Xiaoma, commented. “What happened to the director who made Towards the Republic and The Great Ming Dynasty in 1566? Why did he stoop to make a poor drama like this?” another user commented. For the director, making Martial Universe was an attempt at a new means of expression. “As a creator, there’s no point in contending with the industry, but there’s a point in contending with the self. To attempt a different form or style is to confront one’s past self. No matter how fierce the challenge seems to be, the attempt is definitely positive,” he told NewsChina. “Filmmakers of my generation mostly have a strong desire to pursue high artistic standards and harbor a peculiar complex about the national culture, psychological and history. It’s just in our blood,” Zhang said. His insistence on high aesthetics and fixation on history and heavy subjects usually render his works too highbrow to be popular. It hurt him to see that the viewer rating of The Great Ming Dynasty in 1566 was as low as 0.5 percent when it first aired on Hunan TV in 2007, merely one-fifth the average rating of dramas on the same channel. Not until last year did the public rediscover this buried gem. Uploaded to the leading Chinese video website Youku in 2017, the show soon went viral on social media and a great number of netizens realized they had missed a high-quality drama. In 2009, Zhang directed Confucius, a costume drama based on the life of the great philosopher. The show has already been aired in the US, Japan and South Korea but not in China. Over the past nine years, not one single Chinese TV station has shown a willingness to broadcast this series. “This is the work I am most satisfied with so far. But it can’t be broadcast for they believe it’s destined to be a show with neither ratings nor popularity. Perhaps Confucius or the classics are not needed in this era,” Zhang said. Long troubled by censorship, poor viewership and broadcast failures, the director still strives to provide quality content. “There’s a saying that goes, ‘Wipe clean the blood on your body, bury the corpses of your comrades and carry on,’” he said. Zhang handed a biography of the Oscar-winning American filmmaker Oliver Stone to our reporter during the interview. He very much admires Stone’s versatility in dealing with serious political issues in films like JFK (1991), Nixon (1995), W. (2008), Snowden (2015), and also crime films and thrillers such as Natural Born Killers (1994), Wall Street: Money Never Sleeps (2010) and Savages (2012). Zhang himself strives to become an all-around creator that never limits the boundaries of self-expression.